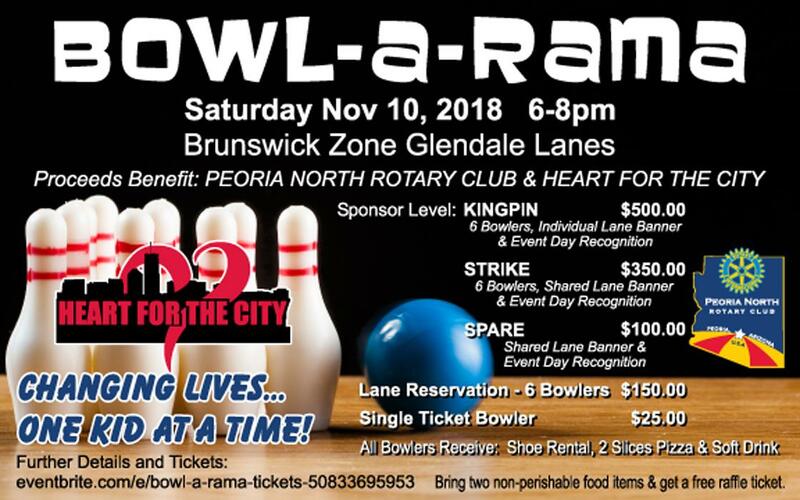 Peoria North Rotary Club will be holding its first-ever Bowl-A-Rama fundraiser November 10 at Brunswick Zone Glendale Lanes. The club will team up with another charity, Heart for the City, to raise money for at-risk youth in the West Valley and projects supported by the Peoria North Rotary Club. The event takes place from 6-to-8 p.m. at the bowling alley, located at 17210 N. 59th Avenue, Glendale. Individual entries are welcome, as well as team entries. Cost is $25 per person, or $150 for a team of six. Admission includes rental of shoes, two slices of pizza and soft drinks. Business sponsorships are available as well. A “Kingpin” sponsorship costs $500 and includes tickets for six bowlers, individual lane banner and event-day recognition. A “Strike” sponsorship costs $350 and includes six bowler entries, share lane banner and event-day recognition. A “Spare” sponsorship level is available for $100, and includes a shared-lane banner and event-day recognition. Participants who bring a non-perishable food donation will receive a free raffle ticket.